One of the biggest challenges when trying to present data clearly centers around filtering the important stuff. It’s easy to see aggregate data, but you really need to pick apart the data to find meaningful insights. Google provides you with standard advanced segments such as organic search, non-paid search, referral visits, visits with conversions, and so on. They also allow you to create up to fifty of your own segments using any mixture of metrics and dimensions that you can think of. I create all sorts of advanced segments relative to my needs. Do you want to know how visitors from Bing who searched for branded terms perform, or maybe you want to group a small number of landing pages together so you can see data measured against only those pages. Normally, you’d have to select the secondary dimension (Bing, or your landing pages) and then filter the data using the search form. 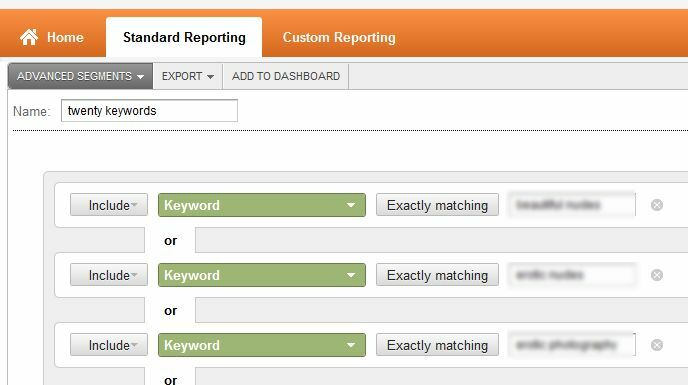 Instead of doing that each time you want to see Bing traffic, or a certain group of keywords, simply create an advanced segments. When I set up a new keyword campaign, one of the first things I want to do is easily track their performance so I can identify which ones are the most worthwhile to pursue. There are two easy ways to do this. The first is to set the keyword metric to show exact matches for your keywords, as shown in the graphic below. The alternative is to choose keywords to match Regular Expressions. Instead of creating a separate rule for each keyword, you can group them together like this: ^(keyword1|keyword2|keyword3)$ which would match the exact words contained in between the pipes. For more tips on keyword grouping using regex. Grouping pages together from a certain section of your website. Choose the “page” or “landing page” segment, and use regex to filter the pages you want. A particular traffic source, like Twitter, Facebook, or sites from linkbuilding campaigns. Choose the “source” dimension and set the match value to “containing” and include the name of the website. These are just a few examples of what you can do with advanced segments. Avinash Kaushik has a great article that expands on these ideas and provides a great place to learn more about how to use advanced segments to report more effectively.